Grid prices were last updated April 24th 2019 08:23 AM. For latest prices, click through to the offer results. Fethiye holidays take you to the Turquoise Coast of Turkey's Dalaman region. Fethiye has had a long history and is a very interesting area scattered with historical sites. Although there was a huge earthquake in 1958, many of the historical buildings remained intact and it was the modern areas that were the worst hit. The town was built around the port and its busy harbour. Fethiye itself does not have a beach but there is a regular water taxi to Calis beach across the bay. The sand and shingle shore is gently lapped by the crystal waters of the Mediterranean. 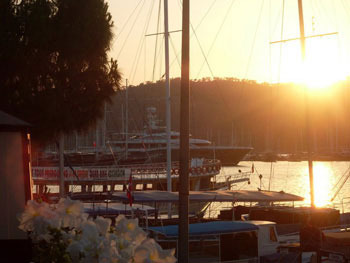 Fethiye is also close to the famous Olu Deniz blue lagoon. The resort is a great base for those who are looking for relaxation under cloudless skies but wish to combine this with cultural and recreational activities. Fly to Turkey from your regional airport. With low cost airlines flying from many regional airports, travel to Dalaman has never been cheaper. Transfers take a little longer than an hour. The holiday season begins in April and continus until the end of October with temperatures soaring into the thirties during the height of summer. 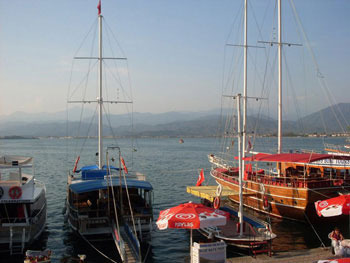 Cheap Fethiye holidays offer accommodation that reaches high standards with tariffs to suit most budgets. Service is very good and you are always assured of a warm welcome in this relaxed and friendly town. Fethiye's eateries cater for all tastes and pockets. Even those with a very conservative palate will find food to satisfy. Do try traditional Turkish foods or you'll be missing out on some culinary delights. The old town is the place to go if you enjoy a little retail therapy. The narrow streets are filled with shops and stalls selling all manner of goods. The town's bazaar is a favourite with shoppers. Evenings are spent in restaurants and bars, some of which are lively, but Fethiye is certainly not considered to be a party resort. There are many excursions from the harbour and one of the most popular is to visit the pretty islands in the bay. You can also visit the breeding ground of the loggerhead turtles in Dalyan. Compare a vast selection of holidays to Fethiye today. If you fancy a Fethiye holiday, but find the task of scouring the internet for the cheapest option a little daunting, use our simple search facility that will quickly find you the holiday that gives you the best deal. As a price comparison site we bring you offers from over thirty travel companies, including some of the market leaders, who are all competing for your custom. This competition inevitably leads to great bargain holidays. As the very best offers change daily, don't delay, ring and book today. Check out our Fethiye holidays 2014.